These pictures of the carnival will make you wish you were there. 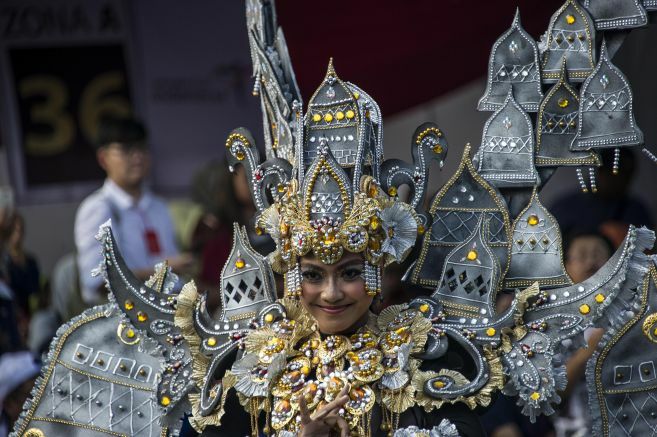 This picture taken on August 13, 2017 shows a costumed Indonesian performer participating in a parade during the Jember Fashion Carnival on eastern Java island. The annual parade brings designers creating elaborate and vibrant costumes with traditional Palembang, Toraja, Borneo, Papua, Lampung, Bali and Betawi influences, which saw some 2000 participants parading in a 3.6 kilometer route around the city. The 16th Jember Fashion Carnival was wonderfully held on August 9 to 13 in Jember, East Java. With "Victory" as the theme, participants paraded amazing Indonesian-themed costumes with thousands of people including local and foreign photographers coming to witness the incredible show. President Joko Widodo along with the first lady Iriana, Tourism Minister Arief Yahya, Culture and Education Minister Muhadjir Effendy, National Secretariat Chief Teten Masduki, East Java Governor Soekarwo and Presidential Spokesperson Johan Budi also attended the event. The participants showed various costumes with influences from local areas including Bali, Betawi, Kalimantan, Lampung, Palembang, Toraja, Papua and many more.